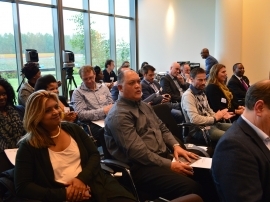 On the 25th of October 2016 SANEC, The Embassy of The Republic of Botswana in Belgium and the Botswana Investment and Trade Center (BITC) organized the first Botswana-Netherlands Trade Investment Forum at KPMG Headquarters in Amstelveen. We would firstly like to thank H.E. Ambassador of the Republic of Botswana, Mr. Samuel Outlule for attending, the BITC’s presentation of interesting information and international business opportunities found in Botswana, and our KPMG Partner Hans-Peter van der Horst for hosting us. And of course, we would like to thank you for attending our event. The live streamed event, made possible by Business Safari TV and moderated by SANEC's General Manager Mark Agterdenbosch, highlighted the available business opportunities and investment options in several sectors in Botswana, such as Transport Infrastructure and Logistics, Agriculture, ICT, Mining, Energy and Health care. At first we received a warm welcome by H.E. Ambassador of the Republic of Botswana Samuel Outlule and our KPMG Partner Hans-Peter van der Horst. H.E. Samuel Outlule mentioned the importance of the relationship between SANEC and Botswana. He viewed SANEC as their friend and preferred co-operation partner in endeavours of the Embassy of Botswana to attract Dutch Businesses into Botswana. Ms. Bame Moremong, Director Brand Management of Brand Botswana, started off with an insightful presentation on Botswana as a place to live, visit and invest. She elaborated on prompt facts and investment reasons on Botswana, with an emphasis on countries’s safe and secure environment . Mr. Moemedi Mokgosi, Executive Director International Business EU of the BITC (Based in London) gave a detailed presentation on the wide range of key investment opportunities in Botswana. He noted chances for the Dutch business community to be involved in leather manufacturing, cargo and logistics, ICT, Minerals, Coal, and Agriculture. Mr. Moemedi Mokgosi also underlined current investment projects, such as the Botswana railway project and Airport project. Lastly, SANEC member Martijn de Liefde held a presentation on his experiences of doing business and opening up his company Kgotla in Botswana. He mentioned “the understanding of cultural differences”, as an important factor that should be kept in mind when doing business as a Dutch person in Botswana. After the presentations, SANEC organized matchmaking sessions for the companies with BITC. At the end, the guests were also treated to some delightful drinks and snacks while given a chance of networking and building sustainable business relationships. Please have a look at the presentations of Ms. Bame Moremong, Mr. Moemedi Mokgosi and Mr. Martijn de Liefde. Please click here for a photographic impression of the event.